The world is becoming more and more instrumented, interconnected, and intelligent in what IBM® terms a smarter planet, with more and more data being collected for analysis. In trade magazines, this trend is called big data. information over time to optimize energy usage. Utility meters (referred to as smart meters) allow utility companies to collect information over a wireless network and to collect more data than ever before. Storage savings: Storage can be optimized when you know the characteristics of your time-based data. Informix TimeSeries often uses one third of the storage space that is required by a standard relational database. Query performance: Informix TimeSeries takes into consideration the type of data to optimize its organization on disk and eliminates the need for some large indexes and additional sorting. For these reasons and more, some queries can easily have an order of magnitude performance improvement compared to standard relational. Simpler queries: Informix TimeSeries includes a large set of specialized functions that allow you to better express the processing that you want to execute. It even provides a toolkit so that you can add proprietary algoritms to the library. 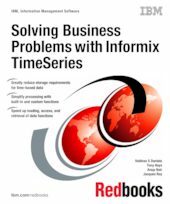 This IBM Redbooks® publication is for people who want to implement a solution that revolves around time-based data. It gives you the information that you need to get started and be productive with Informix TimeSeries.